Hindus believe mount Kailash to be the abode of Lord Shive and Parbati. For a hindu, to make the arduous pilgrimage to Kailash and have the Darshan (divine view) of Shiva's abode is to attain release from the clutches of ignorance & delusion. Thousands of Hindu religious people come to visit the sacred mount Kailash and Mansarovar Lake, situated in the China's Autonomous Region of Tibet, every year from around the globe and neighboring country India via Nepal. The snow-capped rocky peak-Kailash Parbat (mountain) 6714meters considered a holy abode of supreme Hindu god Shiva, is also believed to be a place where founders of Tibetan Buddhism, Jainism and Bonpo religions once resided. Hindus and Buddhists all over the world also worship this peak as the exact "Centre of the Universe". The word "manas" means mind or consciousness; the name consciousness and enlightenment. Mt. Kailash lies the most sacred lake of Hindus Mansarovar Lake (4580m) has held deep spiritual influence and wide religious among Hindu & Buddhists. Making round of the lake and taking a dip in it is believed to be Purge one's soul from sins and the body from sickness. Still there are others, who believe one can not only clean his soul but also secure his place in heaven after the end of mortal life one more school of thought us that taking a dip in it helps one attain Moksha (free from the cycle of birth and re-birth in the worldly life). This lake is so gigantic that it takes three full days to just go round its peripheries. One dip into the cold water of this holy lake is believed to free the soul of all its sins, thus carving a straight path to heaven after death. Ancient Hindu scriptures indicate this lake as a must visit place for someone who wants to attain salvation - the highest level of achievement in Hindu religion. The cascading waves of the Lake in the wind look very charming. 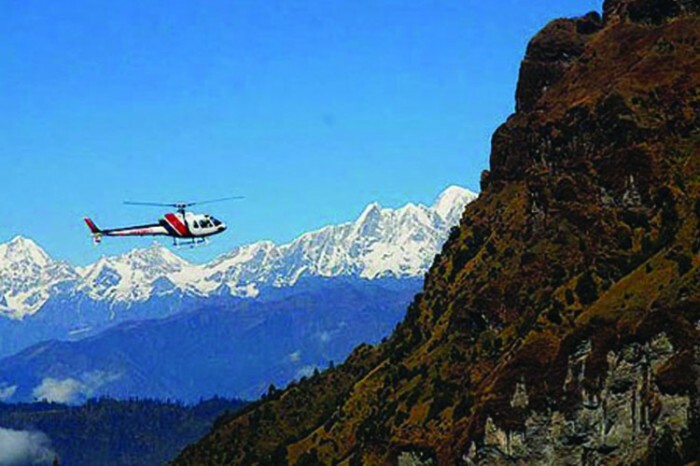 Himalayan Pilgrimage Journey makes very pleasant & smooth Yatra every year by helicopter ride. So, please join with us and take our best services for this trip. Yak and Yak man for Mount Kailash Parikrama. All other expenses not mentioned in the cost include section. Arrival to Tribhuwan International Airport and transfer to hotel. Evening visit to Pashupatinath to see Aarati. Today we will visit Pashupatinath Temple – the greatest Hindu Temple in Kathmandu. After visiting Pashupati region you will have short briefing about the tour and we will fly to Nepalgunj.Overnight stay at Hotel. Today we will take morning flight from Nepalgunj to Simikot which takes almost 45 minutes and have some rest than we will fly to Hilsa by Helicopter taking about 30minutes. Then we will have one hour scenic drive to Purang (3800m). We will stay overnight in Guest House. Today we will stop in Purang for Acclimatization. You have the option to explore Purang/Taklakot today. Today we will drive to Mansarovar Lake taking about 3 hours by drive. We will have holy bath, Puja and Parikrama of Mansarovar Lake there and stay overnight in Guest House. Today we will drive early morning to Yamdwar (Tarboche) which will take us approximately 3 hours. Tarboche is starting point of Kailash Parikrama. Then we walk for 6-7 hours to reach Dirapuk. Overnight at Guest House. We will trek whole day. First we will trek to Dolma La Pass (5636m) then to Zutulpuk (5790m). we will walk for 10 – 11 hours today. Overnight stay in Guest House. Today we will have early morning walk to Chongdo and drive to Mansarovar Lake. Overnight stay at Guesthouse. We will have early morning drive to Purang and hilsa, then Helicopter flight to Simikot and areroplane flight to Kathmandu via. Nepalgunj. Today our representative will take you to the Tribhuwan International Airport 3 hours before your scheduled flight.